A-HOTEL.com - Luxury and cheap accommodation in Sokolʼniki, Russia. 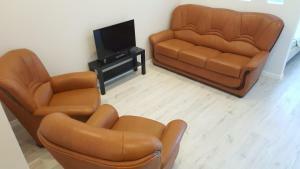 Prices and hotel, apartment booking in Sokolʼniki and surrounding. This indicative offer was derived from the most recently booked accommodation in Sokolʼniki and sort by the price, from cheapest Sokolʼniki accommodation to the most expensive hotels. To select accommodation by your preferences we recommend to choose from 1 accommodation offers in Sokolʼniki in total. By entering the dates of your overnight stay in Sokolʼniki and using the filter tools you can sort the best possible accommodation for you. The entered dates of your stay are crucial for the most accurate offer as it derives all the online information on pricing and availability of Sokolʼniki accommodation. Then you can book the selected Sokolʼniki lodging (hotels, apartments etc.) immediately. Set in Sokolʼniki, Villa Brusnichka provides accommodation with a private pool. This country house has a garden. Featuring accommodation with a terrace, Дача на берегу моря is located in Zelenogradsk. Guests staying at this holiday home have access to a fully equipped kitchen. This 2-storey hotel is located 800 metres from the sandy beach. A swimming pool, Russian cuisine, and rooms with a balcony are all featured here. Offering free WiFi and garden views, Villa Tobias is an accommodation situated in Kamenka. Boasting a terrace, the holiday home is in an area where guests can engage in activities such as windsurfing, cycling and fishing. дом для отдыха на Балтийском побережье is set in Priboy and offers free bikes. This holiday home features a garden and barbecue facilities. Offering self-catering accommodation, Wargenau Holiday Home is located in Zelenogradsk, a short walk from the coast of the Baltic Sea. Free private parking is available. Holiday home on Zelyonaya 11 is set in Zelenogradsk. It offers free WiFi and free bikes. Situated in Zelenogradsk in the Kaliningrad region, Apartment in Zelenogradsk features a balcony. Guests staying at this apartment have access to a fully equipped kitchen. Apartment at Primorskaya 21 is situated in Zelenogradsk. Complimentary WiFi is offered. Located 200 metres from the Black Sea Coast in Zelenogradsk, Apartments on Primorskaya offer free WiFi. All apartments come with a flat-screen TV and washing machine. Set in Zelenogradsk, Apartment Kranz provides accommodation with free WiFi, a flat-screen TV and a kitchen. A microwave and kettle are also featured. Set in Zelenogradsk in the Kaliningrad region, Apartment on Primorskaya 19 features a balcony. Guests may enjoy free WiFi. Situated in Zelenogradsk, Apartment Zhemchuzhina Baltiki na Gagarina features free WiFi and units equipped with a kitchen. Each unit is fully fitted with a washing machine, a flat-screen TV, a sofa and wardrobe. Featuring a terrace, White Wave Apartments features accommodation in Zelenogradsk with free WiFi and sea views. This apartment provides a bar. Located 50 metres from the Baltic Sea, Zelenogradsk Sрa Hotel features a spa and wellness centre with massage, manicure and pedicure services. There is also a sauna complex. AmberSeason Hotel is located in Zelenogradsk, on the coast of the Baltic Sea, just 50 metres from the public beach. Free WiFi access is available. 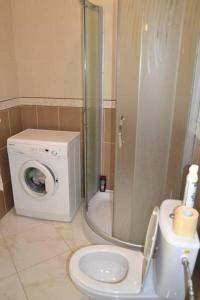 Studio Appartment near Sea Side is set in Zelenogradsk. Guests staying at this apartment have access to free WiFi. Апартаменты с 2 спальнями Зеленоградск садовая 32 а is located in Zelenogradsk. This apartment provides a 24-hour front desk and free WiFi. Apartments na Sadovoy 32A is situated in Zelenogradsk. Featuring garden views, this apartment also provides guests with free WiFi. Featuring accommodation with a balcony, Квартира в Зеленоградске is set in Zelenogradsk. Guests staying at this apartment have access to a fully equipped kitchen.